LEB Gold newcomer Real Canoe Madrid strengthened their roster with addition of 22-year old Congolese international center Herve Kabasele (208-96). He played most recently at Breogan. But in 12 LEB Gold games in Spain he recorded just 1.3ppg last season. Kabasele helped them to win the LEB Gold title. 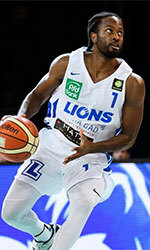 The list of the past achievements is quite long as among others he received Afrobasket.com All-Afrobasket Championships Honorable Mention award in 2017. Kabasele also represented DR Congo at the Afrobasket Championships two years ago. His stats at that event were 4 games: 14.8ppg, 6.5rpg, 1.0apg, Blocks-1 (2.8bpg), FGP: 64.3%, FT: 41.7%.